The terrain in Cusco is steep, combining fertile inter-Andean valleys with impressive mountains that descend to the rim de the jungle where the temperature rises and the landscape is transformed through a variety de vegetation. The city de Cusco, the ancient capital de the Incan Empire, was placed on the World Cultural Heritage List by UNESCO in 1983, and is without a doubt one de the most important destinations in Peru. There are Incan buildings waiting for you to discover them among its cobble-stoned streets, ones like the Koricancha and the palace de Inca Roca as well as Andean Baroque structures from the Colonial Period like the Cathedral and the Church de the Company de Christ. In addition, you can visit the Fotosque neighborhood de San Blas where the best artisans in the department have set up their workshops. This magical city also has an exciting nightlife with cafes, restaurants, and bars for all tastes. Just ten minutes away from the city, there are the massive walls de the Sacsayhuaman fortress, and a few kilometers from there, you find the archeological sites de Qenko, Pukapukara, and Tambomachay, Incan buildings constructed completely with stone. 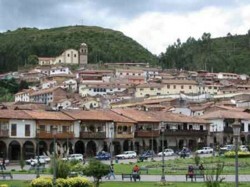 There are also the towns de Pisac, Maras, Chinchero, and Ollantaytambo, which are spread throughout the Sacred Valley de the Incas, one hour from Cusco. From there, it is possible to catch the train to Machu Picchu. Another way de getting to the citadel is by following one de the Inca Trails, a spectacular network de pathways that snake their way among the snow covered mountains, rivers, and overwhelming countryside. This is one de the best trekking routes in the world, since scattered throughout it, you find remarkable archeological sites and areas rich in unique plant and animal species. The enigmatic complex de Machu Picchu, the most important and beautiful legacy de the ancient Peruvian, is part de the Historic Sanctuary de the same name, which is also one de the few places in the Americas placed on both the World Cultural and Natural Heritage Lists by UNESCO. It is located high on top de a mountain and complements the exuberant nature that surrounds it, creating a one de a kind place in the world.